To say the Calgary Flames have experienced a season of peaks and valleys would be an understatement, as entering one of the last few weeks of regular season play they find themselves a mere two points outside of the West’s playoff picture in spite of multiple key injures and bouts with inconsistency. While many bemoan inconsistent play from star players like Jarome Iginla and Olli Jokinen, no Flame has been tied to the whipping post more than center Matt Stajan. 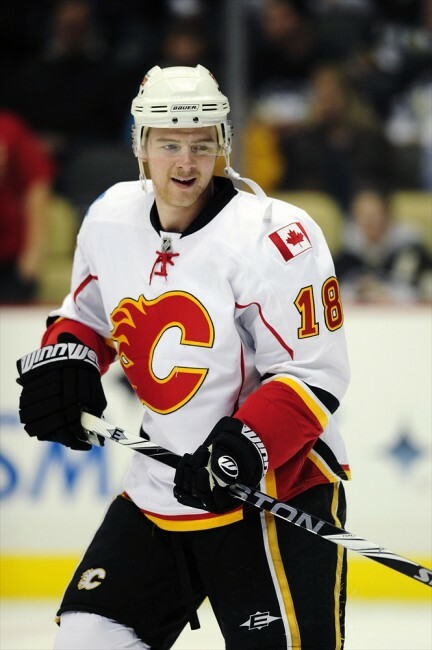 Acquired through the now-infamous trade that saw him come from Toronto with Niklas Hagman, Jamal Mayers, and Ian White for Dion Phaneuf, Keith Aulie, and Frederick Sjostrom, Stajan is the last remaining link to the trade for the Flames after Hagman was waived this past fall. However, this March has seen Stajan center a line between Alex Tanguay and Iginla, allowing him to record 8 points in 10 games so far this month- by far his best period of production in a Flames uniform. While Flames General Manager Jay Feaster certainly faces issues with the center position this upcoming offseason, Stajan’s recent teasing performance may hinder Calgary’s search for a #1 center. While the aforementioned point totals certainly put Stajan in a positive light, other statistics truly validate why Stajan is absolutely thriving on the number one line right now. His face-off win percentage in all but two games this month is above 50%, which is highlighted by a 72.7% performance against Columbus this past Sunday. This impressive streak, combined with an overall +3 rating for the month, is probably why head coach Brent Sutter feels comfortable with him on the ice. Much has been made of the defensively responsible game preached by the Flames for the better part of the last decade, and the ice time received by forwards reflects who is currently buying into that mindset. After playing 14:34 on March 1st, Stajan has seen his ice time climb rapidly as in the Flames most recent game against the Blue Jackets he saw the ice for 22:06- a season high. Stajan is finally paying dividends in his third Flames campaign, but there is legitimate concern as to whether or not this small window of success is indicative of what Stajan’s limitations are. Immediate problems facing Stajan’s security on the #1 line is the potential return of Michael Cammalleri, who before being injured had been recently shifted to the pivot position to great success. Should Cammalleri return, this would give the Flames a center lineup consisting of him, Olli Jokinen, and Stajan. Although Stajan has been hot for almost all of March, Coach Sutter has never been hesitant to shuffle lines should a player falter for a game or two, and this could also send Stajan to 3rd line purgatory or even the press box as a healthy scratch. Given his prior seasons in Calgary, it is clear that Stajan operates on a short leash with the coaching staff- they demand a solid two-way game with offensive contributions and he often focuses too much on one or the other: making a defensive error or gripping his stick tightly out of fear of making a mistake. Should his consistency drop below coach expectations, he could very well find himself demoted to a lower line or scratched despite the Flames’ late season playoff push. However, Stajan as of current has not shown signs of returning to this inconsistency and he is likely to remain with Iginla as long as both are producing. If Cammalleri does return for either the final few games or, in the unlikely scenario, playoffs, Stajan’s emergence as a competent center could even warrant Cammalleri’s return to the wing. Regardless of how Calgary’s season ultimately ends, Stajan’s performance has garnered deserved attention from both management and coaching staff while simultaneously ensuring that he can be the player Calgary thought they traded Dion Phaneuf for. After this season, Stajan has 2 years left on his deal that currently pays him $3.5 million. Should this recent play turn Stajan into a 55-65 point player that is defensively responsible, the Flames faithful will have to find a new target for their discontent.